The trend of world music represented in the Western pop market started at the end of the 1960s with such releases as Brian Jones Presents The Pipes Of Pan At Joujouka (1971), Simon & Garfunkel's single "El Condor Pasa" and Alan Stivell's Reflets ("Reflections"). The Master Musicians of Joujouka are a musical ensemble from the village of Joujouka (or Jajouka) in the Rif Mountains of northern Morocco. The Master Musicians of Joujouka's traditions have been passed down in a supposedly unbroken line going back 4000 years. Their first exposure to outsiders seems to have come through their introduction to the Beat generation. Mohamed Hamri introduced writers Paul Bowles, Brion Gysin and William S. Burroughs to the group. They became fascinated with the music of Joujouka; Burroughs described it as the world's oldest music, and the musicans as a "4000-year-old rock and roll band". In Tangier, Gysin and Hamri founded the 1001 Nights restaurant, in which the musicians played throughout the 1950s to a sophisticated Western audience in what was then an international zone, the "Interzone" of William S. Burroughs' fiction. Brian Jones (co-founder of the The Rolling Stones) recorded the Joujoukan musicians in 1968. 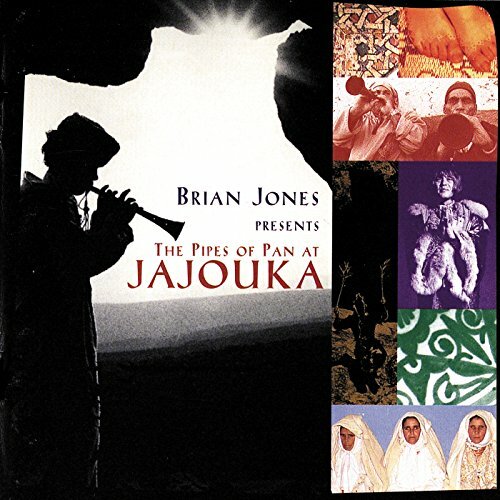 This recording was released in 1971 as Brian Jones Presents The Pipes Of Pan At Joujouka. It fell out-of-print and became a collector's item before being reissued on compact disc in 1997 with a photograph of Bachir Attar, who was only five at the time of the recording, replacing Hamri's original cover painting of Brian Jones and the musicians in Joujouka. Brion Gysin's liner notes were also altered to remove his acknowledgment of the Moroccan painter's role as mentor of the group. This attempted rewriting of history provoked protests and brought media attention on Attar's attempted usurping of the villagers' musical legacy. Some have claimed that the rhaita of Joujouka can also be heard in Mother's Little Helper, but this is disputed.